The financial cohort was stuck in a precarious situation in the latter half of 2018. On the one hand, a rising interest rate environment would provide boosts to bottom line revenue as a function of the increased rates on their deposit base. Banks had domestic and global economic expansion tailwinds at their back while posting accelerating revenue growth, increasing dividend payouts, engaging in a record number of share buybacks, benefiting from tax reform and deregulation. Augmenting this positive backdrop was a record number of IPOs, a record number of global merger and acquisitions along with consulting fees regarding mergers and acquisitions and trading around market volatility. All of these elements ostensibly provided an ideal confluence that boded well for the financial sector. JP Morgan (JPM), Citi (C), Wells Fargo (WFC), Goldman Sachs (GS) and Bank of America (BAC) seemed to be poised to continue to benefit from the favorable economic backdrop. Despite all these elements, 2018 was terrible for the financials which performed horribly, especially during the fourth quarter as rapid rate hikes were in the cards. There was negative sentiment that cast a cloud over the group that placed the financials in a downward pattern for much of 2018 over concerns of overly aggressive interest rate increases and the potential for an inverted yield curve (Figure 1). An inverted yield curve is an interest rate environment in which long-term debt instruments have a lower yield than short-term debt instruments. This type of yield curve yield is widely considered to be a predictor of economic recession. Historically, the inverted yield curves have preceded many U.S. recessions. Due to this historical correlation, the yield curve is often seen as an accurate prediction of negative business sentiment and ensuing economic slowdown. An inverse yield curve predicts lower interest rates in the future as longer-term bonds are being demanded, sending the yields down. The banks would certainly be negatively impacted by an inverted yield curve as the gap between long-term and short-term Treasury yields potentially unfold and serve as a reliable predictor of difficult economic conditions ahead. Banks borrow at short term rates via deposits and interbank lending and lend at long term rates to businesses, autos, and home loans. Thus, when long-term rates exceed short-term rates, bank lending is profitable, and the opposite is true under inverted yield curve conditions. This typically signals troubled credit markets via restricted access to capital and reduced lending to fuel the economy. Now that the Federal Reserve has heeded slowing global growth, strong U.S. dollar, trade war, government shutdown, weak housing numbers, retail weakness, auto sluggishness and oil decline via a softer stance on rising interest rates the financials have room to breathe. 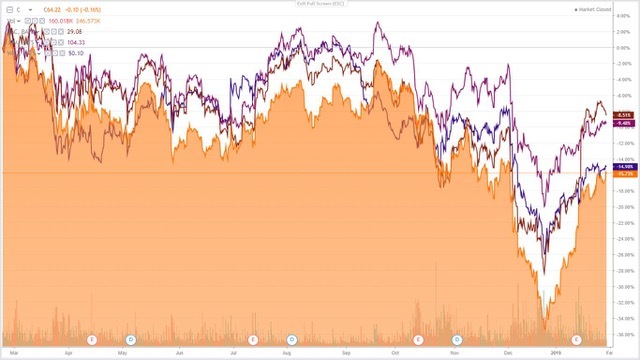 All of the major banks have witnessed a significant bounce from their fourth quarter lows as clarity has now entered the economic interest rate narrative by the Federal Reserve. The banks are healthier than ever, well capitalized with strong balance sheets. Now, the Federal Reserve-induced headwinds that cast clouds over the financials have been lifted. The banks are coming off of record profits and revenue across the board. Wells Fargo, for instance, is attempting to put its controversial past behind the company and recently posted its best quarter in its company’s history. Goldman Sachs posted record growth numbers that sent the stock up for its biggest one day gain since 2009, popping 10% post Q4 earnings. Bank of America echoed these other big banks, beating on earnings and revenue while costs were down. The stock advanced nearly 5% as a result of these strong earnings. Citi reported solid earnings and caught an upgrade as a result with the stock following suit and rising over 4%. With all these solid numbers from all the big banks expected to continue coupled with a moderating Federal Reserve stance on rising interest rates may allow this group to be liberated finally and appreciate higher. The financial cohort had been decimated in 2018 and particularly in the fourth quarter largely due by a Federal Reserve induced sell-off over rapidly rising interest rates regardless of broader economic data. Now that the Federal Reserve has taken notice and acknowledged cracks in the global trends via slowing global growth, strong U.S. dollar, trade war, government shutdown, weak housing numbers, retail weakness, auto sluggishness, and oil decline. The favorable economic backdrop of a moderately rising interest rate environment, tax reform, low unemployment, wage growth, deregulation and tax reform will allow the banks to continue their path of record profits. The inverted yield curve is typically indicative of a looming recession and will negatively impact the banks and their ability to run profitable businesses under such conditions. Fears of a Federal Reserve induced economic slowdown via interest rate increases and the potential of an inverted yield curve have been subdued as of late by Jerome Powell. The deregulation and rising interest rates coupled with a strong economy have allowed the banks to return record amounts of value to shareholders via increased share buybacks and dividends. The financial cohort is very inexpensive and poised to benefit from the easing Federal Reserve stance on rising interest rates for the foreseeable future. Disclosure: The author holds shares of Citi and BAC and may engage in options trading on any tickers mentioned in the article. The author has no business relationship with any companies mentioned in this article. He is not a professional financial advisor or tax professional. This article reflects his own opinions. This article is not intended to be a recommendation to buy or sell any stock or ETF mentioned. Kiedrowski is an individual investor who analyzes investment strategies and disseminates analyses. Kiedrowski encourages all investors to conduct their own research and due diligence prior to investing. Please feel free to comment and provide feedback, the author values all responses. The author is the founder of stockoptionsdad.com a venue created to share investing ideas and strategies with an emphasis on options trading.